Thinking about a bathroom remodel in Roswell, GA or surrounding areas? Are you dissatisfied with the current state of your bathroom? Maybe you’ve seen pictures of other elegant bathrooms and wish yours could be the same. But year after year your bathroom goes unchanged because you’re just not quite sure how to make your dream bathroom a reality. If this sounds like you, here are seven tips for making your dream bathroom come to life. First, you need to gather some remodeling ideas for your bathroom. You may have a rough idea as to what you want your bathroom to look like, but there are a lot of options out there. By searching for some new ideas, you can be sure that you’ve considered all your options and that the design you ultimately go with is the one you want. Try searching sites like Pinterest or Instagram for bathroom renovations to get a good idea as to what’s possible. With a bunch of ideas floating around in your head, now is the time to formulate a plan. 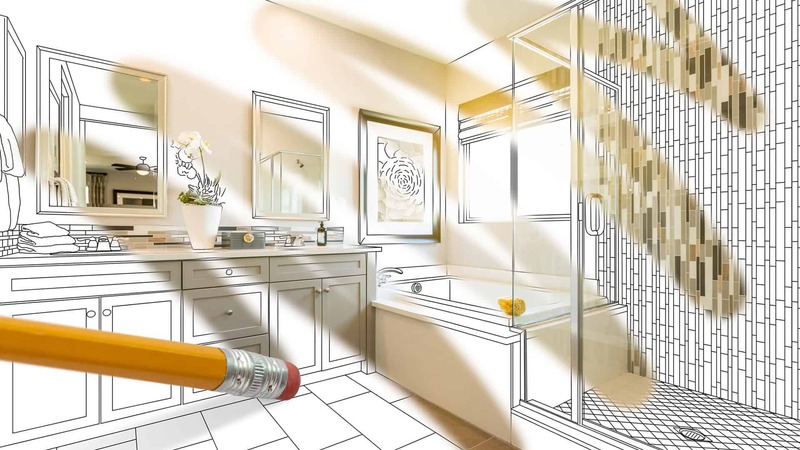 You won’t want to renovate your bathroom without planning ahead, as this could end up costing you more money and you might not be happy with the finished product. Take the time to plan out each aspect of your dream bathroom – What do the floors look like? Where is the tub? What color are the walls? The more detailed the plan, the better off you’ll be. When formulating your plan, you’ll want to think about the existing plumbing. Changing the plumbing around is a difficult process, so you’re better off keeping things where they are. For example, if your sink is currently on the left side of the room, moving it to the right side would be an expensive and time-consuming process. When designing your perfect bathroom, think about how the plumbing is currently set up, and how you can work this into your design, rather than changing it around. 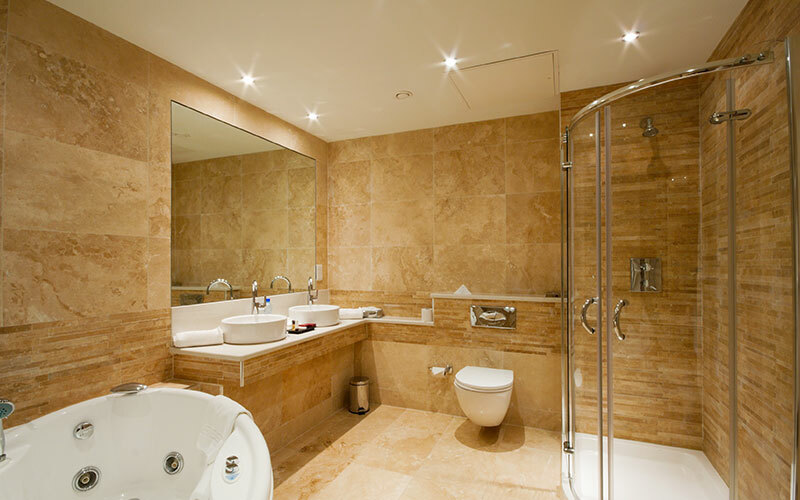 The lights in your bathroom play a large role in determining the feel of the room. Often the lights are thought of last – instead we focus on things like the shower, the floor tiles or the paint color. As you’re creating your dream bathroom, you’ll want to make sure you’ve installed the correct lights for the room, otherwise, all the other elements will lose some appeal. A great thing you can do when going through a bathroom renovation is to add some tech upgrades. This could be some waterproof speakers in the shower so you can listen to music, or maybe it’s adding some heated floor tiles. A few small tech upgrades can make a big difference, so think about what you want to add while designing the room. Most of us can’t finance a complete bathroom renovation overnight. We need time to save up and to find some room in the budget. When you’re planning out your dream bathroom, consider the bathroom remodel cost. By factoring in the costs, you can then see if you need to scale back what it is you want or figure out how long it will take you to save up the money. You don’t want to come up with the perfect dream bathroom plan, only to discover you can’t possibly afford it. Finally, you need to find someone to do the job for you. Bathroom remodeling isn’t an easy task, so you’ll want a professional to handle everything for you. If you need a bathroom remodel in Roswell, GA then DConceptHomes Bathroom Remodel is here to help. We can provide you with bathroom remodeling ideas, discuss your plan with you, and then help to implement it while sticking within your budget.